Specialty Programs for girls and boys entering 5-8th grade. Each program is a full day program 9:00am-3:30pm. Programs are run by Counselors and Instructors who specialize in computer programming, art, drama and general camp activities. Do you love ALL Sports, not just football, soccer and baseball but the recreational ones too like; gaga ball, parkour, ultimate frisbee, floor hockey and whiffle ball? Then this is the camp for you! Spend the entire day playing a wide variety of active sports and games on the field and the courts both indoors and out. Develop skills, learn to play a new game, work as a team and meet some like-minded friends! Counselors are coaches and mentors. Their goal is to make sure each participant is having fun, encouraging teamwork, and instill positive sportsmanship. This program is perfect for the art enthusiast! Join us in exploring and creating a wide variety of art projects through many aspects of multi-media! Spend each day learning a new technique to create some beautiful pieces of art that you can use, wear and display. Campers will be able to work independently and with others, to collaborate on a project and also critique each other’s work, offering advice and feedback. Our state-of-the-art classrooms are air conditioned and fully stocked with supplies for campers to use. Each day will be instruction on a project and campers will have the day to work on one or many. Some projects may include; duct tape wallets, jewelry making, create your own thread bound writing/drawing journal, watercolor art, and clay sculpture. Girls enjoy and consume technology as much as their male counterparts but make up less than 20% of the tech jobs in the United States. Every aspect of STEM skills is accessible to anyone with the imagination and desire to learn and create. In this girls only camp, campers will have hands on experience with a new technology each day in a safe and nurturing environment to discover what aspects of the digital frontier appeal most to them. Code with Scratch 3.0 as they program robots, game controllers, musical instruments and wearable technology. Create their own videos and learn the business of YouTube while keeping themselves safe online. Enhance their STEM skills while building and reliving history with Minecraft. Design and build their own webpage with WordPress and open an avenue to entrepreneurship. Discover the real truth behind social media that permeates society and become an educated consumer who keeps her wits and self confidence in today’s day and age. Minecraft, one of the most popular video games in the world, is more than just a game. An official Immersive Education (iED) learning technology, Minecraft is used by iED teachers around the globe to teach learners of all ages about culture, history, science, technology, engineering, arts & architecture, coding and math (STEM). Campers also learn the fundamentals of team-based collaboration and 3D design. Campers will use Minecraft to develop logical thinking and problem-solving skills while creatively expressing themselves through 3D artistry, design and architecture. With an emphasis on teamwork and collaboration, campers will work together to virtually re-create a site from the Boston Freedom Trail, such as Paul Revere’s House, or The Old North Church. YouTube is one of the most popular mobile apps and websites for both children and adults. Almost 5 BILLION videos are watched on YouTube every single day, by over 30 million visitors. Not only is YouTube an incredibly popular destination for youngsters, it can also be extremely lucrative. Last year, for example, the youngest YouTube star made over 11 million dollars at the tender age of just 6 years old! Despite being the world's most popular digital destination for children of all ages, most people don’t realize that the minimum age to be a "YouTuber" (someone who creates YouTube videos) is 13. So, what is a young video creator to do? In a safe, socially conscious way, this camp will teach your child how to create and share their videos on YouTube. Campers will also learn how their parent or legal guardian can authorize them to be a YouTuber if they are younger than YouTube's minimum age limit. 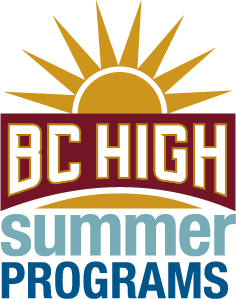 Campers will develop their imagination and increase their confidence as they develop, film and edit their own videos using BC High’s theatre, green-screen technology and state-of-the-art video editing tools from Apple and YouTube. Media literacy and online safety will be reinforced during the week as they learn the technical skills to create a video the entire family will be proud to share. Join BC High Drama Teacher Janet PetitBon in our air-conditioned 350 seat state-of-the-art theatre, as campers will participate in this year's musical of a modern-day Alice in Wonderland. We will focus on all aspects of a musical including auditions, creating a character, choreography, costumes, props, and sets. Campers enjoy a positive, inclusive environment which culminates in a full afternoon performance for family and friends: Friday, August 9th at 12noon. No experience necessary- just a willingness to learn and have fun! Computing jobs are the #1 source of new wages in the United States yet most of those jobs remain open due to lack of qualified applicants. Engaging young minds to the excitement of programming gives benefits not only in their future but develops computational thinking, algorithmic logic, problem-solving and creativity which are assets to them today. Campers will code with the latest and greatest version of Scratch 3.0 from the MIT Media Lab officially released this year. They will program a wide variety of robots sure to excite them in ways they could not have previously imagined. Harness the love of legos and robots when working with Lego Mindstorm EV3 and Lego Education WeDo 2.0. Rock out with musical instruments and play video games on controllers they created themselves with Makey Makey and microbit.